Last Friday I had a visit from one of my Yorkshire cousins, Jennifer – a nice reason for making a proper cake as we are now in Bake Off season! 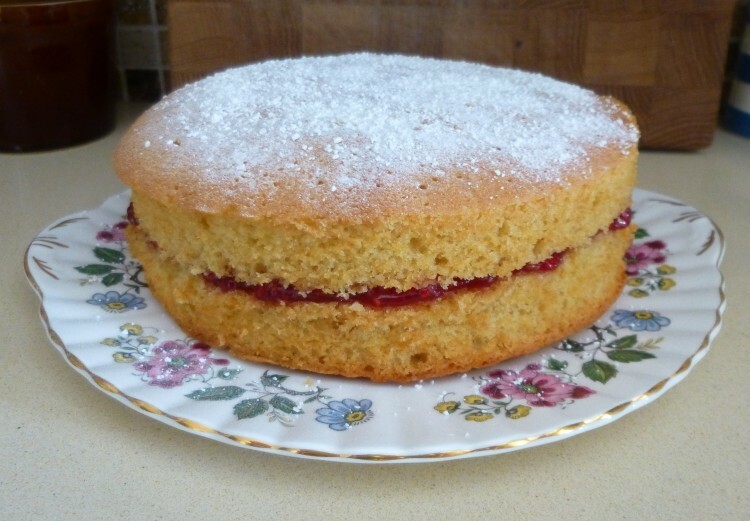 – so it was a Victoria sponge filled with homemade raspberry jam. On Saturday I took an old friend, artist Stella Brand, to The Gallery in the Garden at Great Saling. This was a new gallery for me, and I was impressed by the lovely airy space, and the light which comes in from the south facing windows overlooking a huge walled garden. 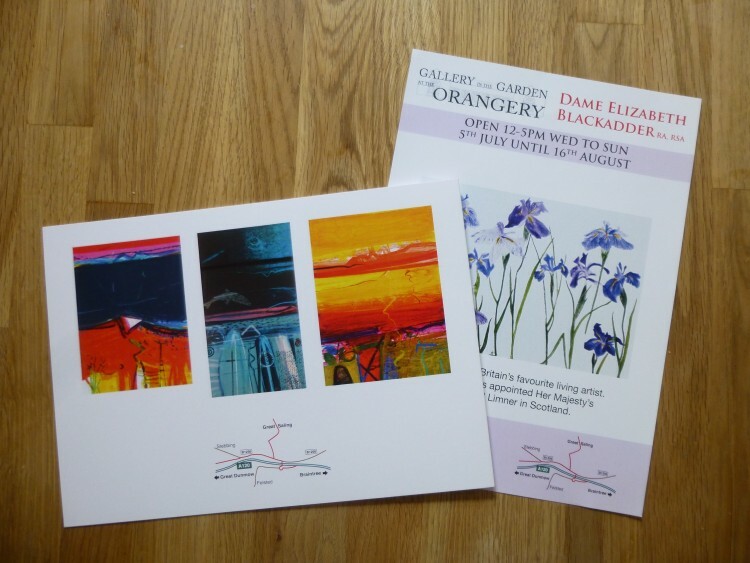 The show was work by Dame Elizabeth Blackadder RA RSA, which runs until 16th August, and this is followed by an exhibition of work by Barbara Rae CBE RA which starts on 23rd August. The Gallery is open from Wednesday to Sunday, 12-5pm. There is a café area at the end of the gallery, with more seating out in the garden, and we had tea and delicious cake – more cake! 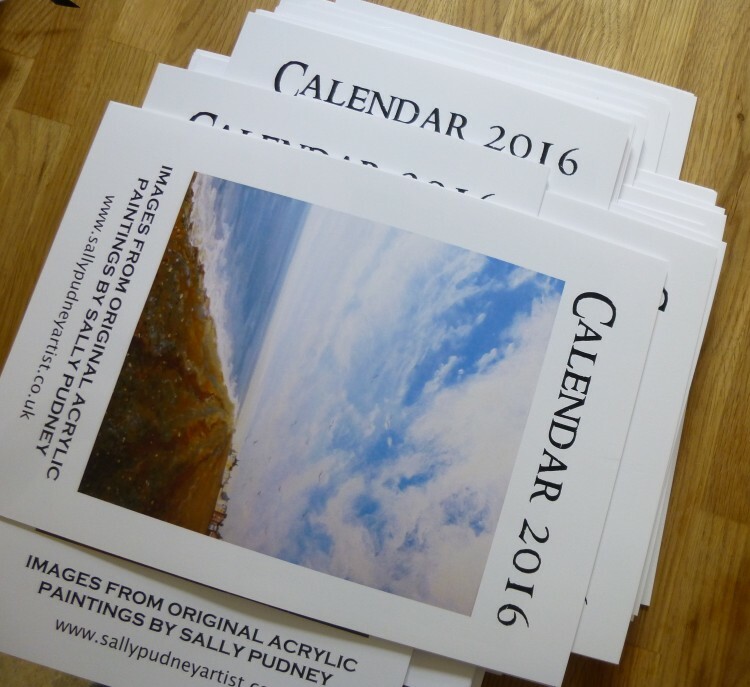 Since Sunday I have been busy printing off my calendars ready for Open Studios. I use Staples double sided Brochure and Flyer Paper, which is expensive but it is worth it because there is ABSOLUTELY no show through, and it has a lovely velvety surface. And I set the printer on ‘Best Photo’ which means it uses masses of ink, and takes forever to print each sheet, but it gives a very good result. Prompted by requests from people who bought last year’s calendars, I have added a sheet at the back stating the title and location of each of the 13 paintings. At the moment the loose sheets are stacking up on the kitchen table, waiting to have their spiral binding. While the printer has been churning away I have been busy completing notarial faculties for the Faculty Office in Westminster – I’ve finished three so far this week, for Cambridge, Kent and New Zealand! – and painting – I’ve nearly finished a new landscape which is rather similar to ‘Before the Harvest’. It is the same field but it is earlier in the year, when the wheat still has that lovely greenish tinge, and it is from a spot further down the field where the field edge path is more visible and the slope is steeper. Watch this space! ← Jute bags – a free give away!